Dropbox, the popular cloud storage service is adding features that are going to take away the pain of syncing files across devices. Dropbox is the beloved service among tech savvy crowd because of its simple to use app and clean web UI. Dropbox for Android new version hit Android Market today with new feature. Now the app can auto import photos and videos from your Android phone, The files will be stored in Camera uploads folder, that is the same folder used by the desktop app. You can use this feature using Wi-Fi or cellular data plan, remember data plan may incur significant charges depending on the usage. This will surely clutter your dropbox folder but it solves the purpose of backing up your photos to your computer immediately. Dropbox offered 3GB of extra space to users who wants to participate in the beta release of the desktop app to test auto upload feature of Dropbox app. Now with this release also they are offering free space. We’re really excited about these new features, and we think you’ll like them. 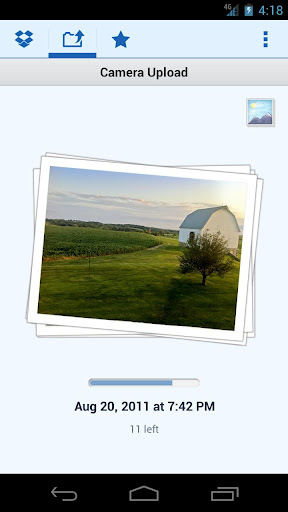 To help you get started saving your photos, we’ll give you 500 MB of Dropbox space for your first automatic upload. As you take more photos and videos, you can use this feature to automatically upload up to a total of 3 GB extra for free.